We spent over 25 hours researching and testing 15 different steam irons and found that reservoir capacity, sole plate coating, and ease of use were most important. The Panasonic titanium Steam Iron scored high marks in every category and is our top pick. 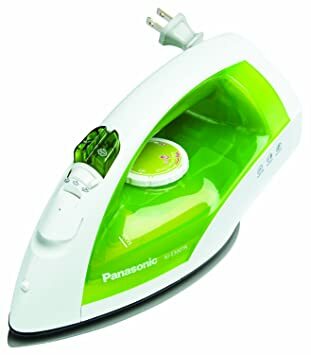 We loved the bright green color of this steam iron as well as the unique U shape that distributes as much as 25% more steam. The non-stick soleplate is designed to concentrate pressure at the center of the iron so we had less snagging of our clothing. The auto shut off after 10 minutes was a welcome safety feature. Many consumers regularly research items before they purchase them to ensure that they are buying a product that is high quality and worth the money they are spending on it. While irons can be purchased for very little money, the good ones, the ones that can be used on many different varieties of materials, will cost more. For that reason we have provided you with a steam iron review that will give you valuable information on the models of steam irons available and how to choose one that is right for you. We have reviewed three of the top ten steam irons on the market in detail, telling you about the features of each one and why they are so popular. You’ll also learn what customers are saying who have purchased these models. You won’t have to go from site to site searching for information, it’s all here for you to learn from and use. By providing this steam iron review, we can save you not only time and energy but money too since you will know how to find the steam iron that fits your needs rather than just buying one on a guess. Read on to learn about these three top steam irons and see which one fits your needs. Not only is this steam iron a beautiful, stylish bright green, it has a unique “U” shape design that circulates the steam. The titanium non-stick soleplate concentrates the pressure at the very center of the iron which means less tugging and snagging of your important clothing. 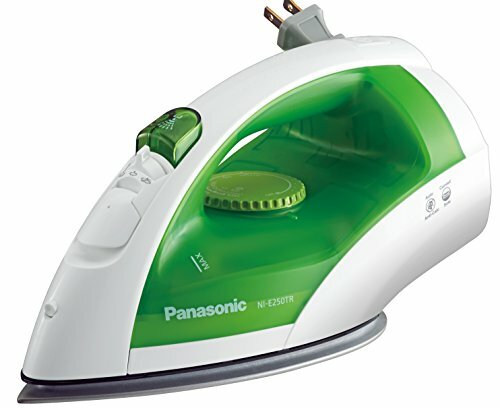 This U-shaped design provides 25% more steam coverage compared to other Panasonic irons. Important safety features include an automatic shut off that activates when left upright and unused for 10 minutes and if it is tipped over onto its side or left on the soleplate (for longer than a minute) it will also automatically shut off. You’ll know whether the iron is on or not with the Temperature Ready Indicator Light. Other features include Dial Temperature Control, Spray Mist capability when you need extra moisture, an Automatic retractable cord reel that makes storage neat and easy, and an adjustable steam feature that you can adjust according to what material you are ironing. There is also a self-cleaning feature and a Jet or Steam option for cleaning the steam iron and for any time you might need an additional burst of steam for wrinkles that seem to want to hang on. Get perfect results on every piece of clothing you iron with the Rowenta DW5080 Focus Stainless Steel Soleplate Steam Iron. Enhanced with an ergonomic thermostat knob that gives a precise reading of different setting options. The Water-Crystal tank has graduation lines ensures precise water levels. The stainless steel precision tip has a sharper point that reaches those hard to access areas that need ironing. Features include 1700 watts of power, an anti-drip system, enhanced thermostat, a 3 way auto off function, large 10 oz self cleaning water tank that flushes out loose mineral deposit is to keep your iron working at its best. The Rowenta Focus has a 7 ft electrical cord with a 360 degree pivot for easy use. The stainless steel soleplate with Microsteam has 400 holes for even steam distribution. The Anti-Calc, anti-scale system extends the life of the iron and keeps build up from discoloring your clothes during use. The 1500 watt Black and Decker Steam Iron features digital display that allows users to customize fabric settings, temperature and steam control. The motion-sensitive auto shut off protects fabrics and the user by shutting down automatically when it is not being used. There is a vertical steam option that allows wrinkle removal even if you don’t have access to an ironing board. The variable steam options allow users to select how much steam they will need for each item they are ironing rather than a one setting fits all. You won’t have to worry about burning your fabric with the non-stick stainless steel soleplate as it glides easily across whatever fabric you are ironing. With fabric settings including: cotton, acetate/acrylic, linen, wool, rayon and others you can iron almost everything you own. Any one of the three steam irons featured in this steam iron review will provide excellent performance and ironing of all your important clothing. 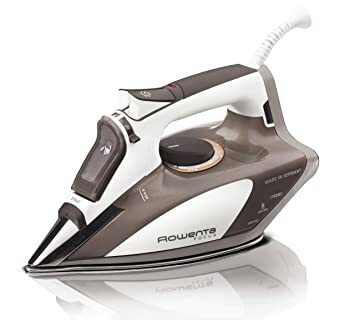 With lots of features and great steam capability as well as integrated safety shut offs, you will get all of your ironing needs met with ease. What is a Steam Iron? Today’s steam irons are loaded with all kinds of features from digital displays to the ability to vertically steam clothes if you don’t have access to a flat ironing surface. For a full featured model the price can run over a $100 dollars but you can get them less expensive as well. When you are looking to find the best steam iron for your needs, it is helpful to know what the features do and what makes one model better or worse than another. Even if most of what you own is wash and wear right out of the dryer with minimal wrinkles, sometimes you may come upon an occasion that you need or want to iron your clothing, such as a job interview, church, business meeting, or wedding. Even if you don’t use it every day, a good quality steam iron is a great appliance to have on hand for those times you do need it. Decades ago ironing was a common and regular part of the daily chores. The irons of that time didn’t have tons of features and steam and water had to be added to the clothing to accomplish the same thing that steam irons do now. Even though ironing isn’t the weekly regular chore for most people that it used to be, there is still a need for people to iron their clothes and having the right steam iron for the job can make it much easier and even enjoyable whether you’re just ironing a shirt or a basketful of laundry. Sometimes people will pull clothes out of storage and they will inevitably be wrinkled and need ironing. A steam iron is perfect for these kinds of jobs. Even though the majority of people who want to buy a steam iron do it because they want to iron their clothes, there are other uses that steam irons are great for as well. You can use a steam iron to give a burst of steam to get rid of carpet indentations after you move furniture around. You can also use steam irons to remove spilled wax from tablecloths, and to re-stick troublesome vinyl floor tiles. (Be sure to use a protective sheeting when working with the vinyl tiles.) If you love to sew and make quilts, steam irons are great for making pieced quilt blocks perfect and ready for sewing and they can also flatten seams too. 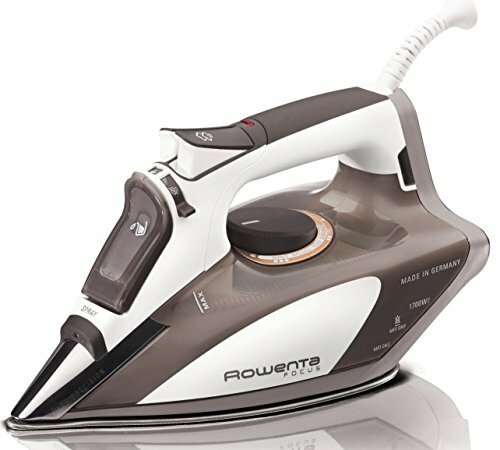 There are many different models of steam irons that range from simple travel iron styles to heavier duty commercial models. All of these will have varying degrees of features, some of which you will use often and others that you may never use. Below we have outlined the most important features that you should include in the steam iron you want to purchase. Steam Functions – There are a few steam functions you want to be sure the steam iron you are looking at has. Variable steam control is when you can adjust the amount of steam you want on a particular piece of clothing. Since different materials take different amounts of steam, this is a very important feature that you will use often. Another useful feature is auto steam which releases steam automatically rather than you having to push a button. You will love this feature when ironing denim since that material usually needs higher steam amounts than others. Non-Stick Soleplate – This is an important feature that keeps the iron from snagging or sticking to your clothing during the ironing process. If you are sure to have the iron on the right temperature setting for the fabric you are ironing you will find the non-stick feature will work on all materials. (using to hot a setting on a delicate material can cause even a nonstick iron to snag or stick) Non-stick soleplates will usually be made of stainless steel or ceramic. Shot of Steam – This feature is great for when you need an extra little burst of steam for things such as getting out tough creases or wrinkles. You can vary the intensity of the steam shot as well with this feature. Self Clean Feature – This is a unique and helpful feature that keeps your iron in good running order and helps it to continue ironing clothes well. Your only job is to make sure that there is no water left sitting in the water tank after you’re done with the ironing. Indicator Lights and/or Transparent Water Tank – Knowing how much water your steam iron has in the water tank is important for proper function. Make sure that your steam iron has either indicator lights to let you know when it needs to be refilled, or that the water tank can be seen clearly to see when it is low. It should have a minimum and maximum suggested water level marked. You also want to be sure that temperature control lights and steam controls are easy to find and read. Your iron will last longer if you empty it after you’re done using it. Don’t leave sitting water in it. Automatic Shutoff – It’s always good to have a safeguard against potential dangers and leaving the iron on accidentally is a common problem that many have experienced. The automatic shutoff function protects fabrics from getting burned and also protects against potential fires being started. Definitely a must have feature! Some Other Features – Some other things to look for in the right steam iron for you will be weight (heavy irons get tiresome to use for any length of time) wattage, length of the power cord and materials that the iron is made of. Titanium and stainless steel will be heavier but last longer. Even though it doesn’t need to be done often, your steam iron will need to be cleaned. This will be even more necessary if you use regular tap water instead of distilled water. The reason manufacturers recommend using distilled water to reduce any accumulation of mineral deposits and lime scale both inside and on the sole plate of the steam iron. The soleplate of the iron can accumulate dirt, stains, and even pieces of burnt fabric that can be transferred to the clothing and even cause stains on the clothing that weren’t there before. If rust forms on the soleplate this can ruin every piece of clothing you iron. Aside from potentially ruining clothes, it can shorten the life of the steam iron as well. Below are some easy methods to use to keep your steam iron clean. Damp Rag Cleaning – Use a large rag, wet it and wring it out and warm the soleplate slightly. Using the damp rag, wipe off the soleplate to get rid of all the dirt and grime. If there are stains on the soleplate, use a nylon mesh pad (not steel wool) and a mild detergent. Dryer Sheet Cleaning – Oddly enough, dryer sheets are great for cleaning the soleplate of your steam iron. Turn the iron on low and rub a few sheets over the bottom until the dirt and grime are gone. After that is done, get a clean dry rage and iron over that to make sure that any dryer sheet residue is removed also. White Vinegar – Vinegar is used often to clean the insides of many small appliances like coffee makers and it is great for cleaning the inside of your steam iron as well. Add vinegar or vinegar and water (equal parts of each) to the water tank of your steam iron until it is 1/3 full. Turn it on medium-high and let it steam for about 5-10 minutes or so until all of the vinegar has evaporated. After that, fill it again with plain water (preferably distilled) and turn the iron on again to get rid of the leftover vinegar and any mineral deposits left. Your last step is to take a clean rag and wipe the soleplate and the steam vents off. This will help prevent rust from forming in the steam vents. For extra cleaning of the steam vents, dip a cotton swab with the vinegar/water mixture and clean each one before running the plain water through. Baking Soda – If you are cleaning stains and rust off of your steam iron’s soleplate you can use a baking soda paste made from baking soda and water, and a soft cloth to remove it. You can also mix vinegar with the baking soda instead of water. White Toothpaste – Toothpaste is another method used to clean things like jewelry and it works well on the bottom of steam irons too. Be certain not to use gel, just plain white toothpaste. You can use a rag or a soft bristled toothbrush and then use a damp rag and wipe it all off to get rid of grime and dirt. Salt – Salt is a good cleaner and can be put on a cotton towel and then have the iron run over it while it is on the highest setting. The steam function needs to be turned off when using salt. This works because the dirt sticks to the salt and leaves your steam iron sparkling afterwards. If there is any melted plastic on the soleplate for some reason, sprinkling salt on aluminum foil and ironing over it should help loosen the plastic so it will come off. Removing Waxy and Oily Substances – If it’s a waxy substance that needs to be removed, turn the steam iron on high (no steam) and run it over a regular newspaper. Oily substances can be removed by soaking a rag in ammonia and wiping the soleplate followed by a wipe down with a damp cloth. You can purchase commercial iron cleaners as well but the methods mentioned above are all natural, very inexpensive and easy to access. There are a few things that you can do to make cleaning easier as well as safe. Be sure to factor in these guidelines when cleaning your new steam iron. If you’ve had a mishap and burned pieces of clothing while you’re ironing make sure to deal with it right away by getting a wet sponge and placing it on the area that the burned fabric is attached to. Because the temperature change will be sudden, it will enable you to peel off the burned fabric from the soleplate much easier. Never use a steel wool pad or metal scouring pad on your soleplate. It will cause scratches on the soleplate. You should also avoid abrasive cleansers for the same reason. They can wear away the non-stick coating as well. Never leave water sitting in the steam iron from one use to the next. When you’re done ironing, empty it out and let it air dry before storing it away. This prevents any potential buildup of mineral deposits. The iron will work better and glide over the clothing better if you run the iron over a piece of wax paper when the iron is hot. An additional salt method involves sprinkling salt on wax paper and running the iron over that. Don’t forget to read the owner’s manual before using your steam iron for the first time. This manual will help you use the features properly and maintain the iron according to the manufacturer’s specifications. Steam irons can be very dangerous. A study done by the American Journal of Behavioral Health found that 78,000 infants and toddlers that had contact burns in 2006, the majority came from clothing irons. These are very preventable injuries and can be avoided completely when you take the proper precautions. Read below to learn the proper safety guidelines that you should be aware of when using a steam iron. Proper Connection to Outlets – Steam irons draw a lot of power from your circuits. When you have your steam iron plugged in, don’t plug in any other high wattage device on the same circuit or you could overload it and cause the circuit to trip. If you use an extension cord, it will need to be rated for the amperage that the steam iron has or higher…never lower. If you’re not sure of the amperage of your steam iron, you can locate that information in the owner’s manual. Whenever you are plugging it in or unplugging it, make sure the iron is turned off, or if it doesn’t have an actual “off” switch, that it is on the lowest setting. Never unplug it by pulling on the cord. Using the Steam Iron in the Proper Place – Never try to iron something while you are wearing it (yes this has happened before) It is also not safe to iron clothing on a bed or floor due to the fact that there isn’t a very stable place to set the iron down. Always use an ironing board or a flat, sturdy table with a portable ironing board on top of it. Safety with the Power Cord – One of the biggest and most common accidents that can occur with an iron is having the power cord hanging in an area where people can trip over it. If the cord is tripped over, the iron can land of them and a serious burn can occur. Make sure that there is no damage to the cord. Using a frayed or damaged cord can result in an electric shock. The cord needs to be kept away from hot surfaces and also away from wet areas as well. Be Careful Around Water – You should never immerse a steam iron in water to clean it or fill it. This can result in an electric shock. When filling the iron make sure it is unplugged first and use a cup to fill it rather than holding it under the faucet. You also need to be careful about turning the iron upside down when filled as you can get burned if there is hot water in the water tank. Keep Away from Children – Irons and children never mix. Make sure that you never leave an iron unattended and don’t iron where children are playing and moving around. If you have to leave the room in the middle of ironing, you need to unplug it and move it to a safe location, or take the child/children with you when you leave the room. Always turn off the iron when leaving the room even if for a few minutes. Fires can start quickly so never take chances. 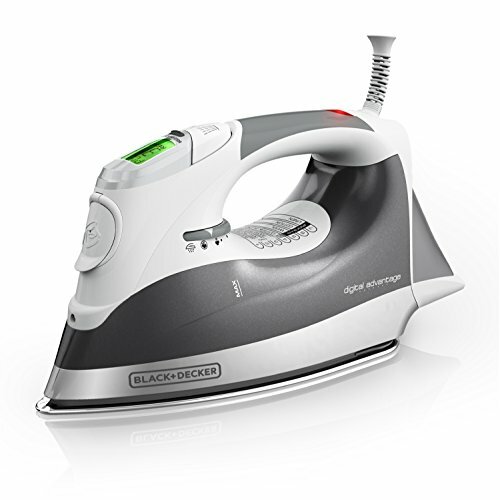 Safety Features – Manufacturers have added many safety features to steam irons to help protect against accidents and problems. Some features include anti-drip feature that will prevent the water from flowing once the iron has reached a certain temperature. Another very popular feature is the automatic shut off function that will turn the iron off when it has been sitting, unused for a length of time. If the iron is upright, the time frame is usually 5-10 minutes unless the soleplate is down or it tips over and then it will typically shut down after a half minute to full minute. With the information in this buyer’s guide you have what you need to make an informed decision on which iron will fit your needs the best. With all of the choices available on the market, it can get overwhelming to choose one and sometimes consumers have to just guess. Now that you know the features to look for and the things that steam irons can do, you will choose one that you will get a lot of use out of and that will take care of all your ironing needs. Steam irons have come a long way and the many features they offer can be a help, especially to those who have a lot of ironing to do. Even if you don’t do a lot of ironing, you will enjoy having one that is easy to use, that has the features you need and want and that can make your clothes look sharp, professional and neat.